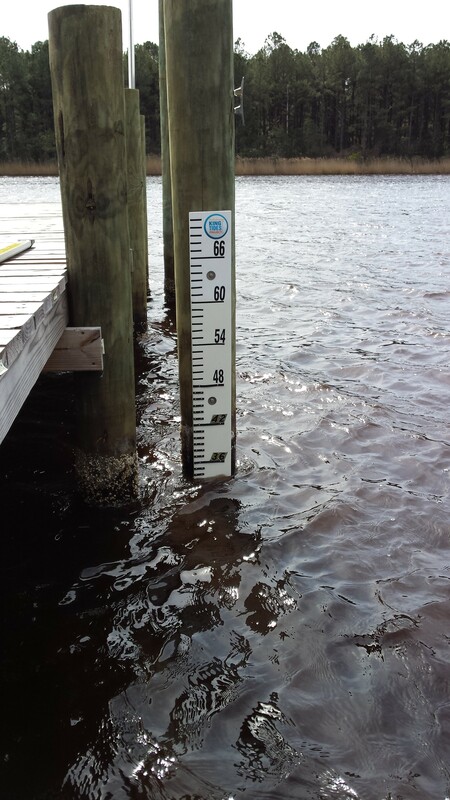 What does sea-level rise have to do with it? 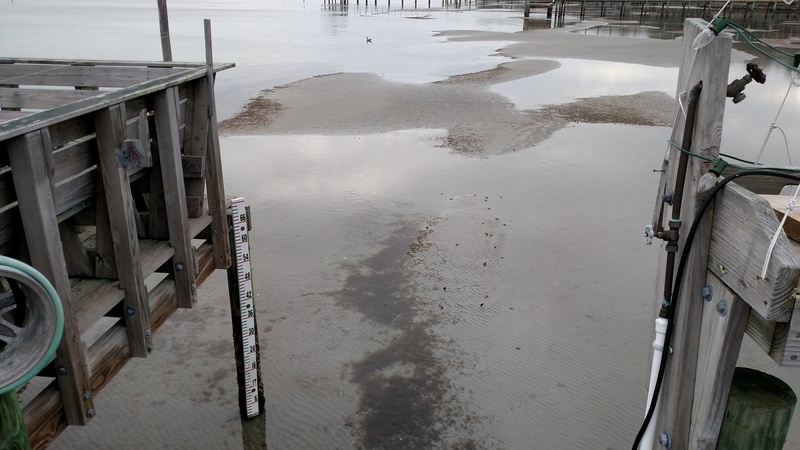 Interested in contributing to coastal science? 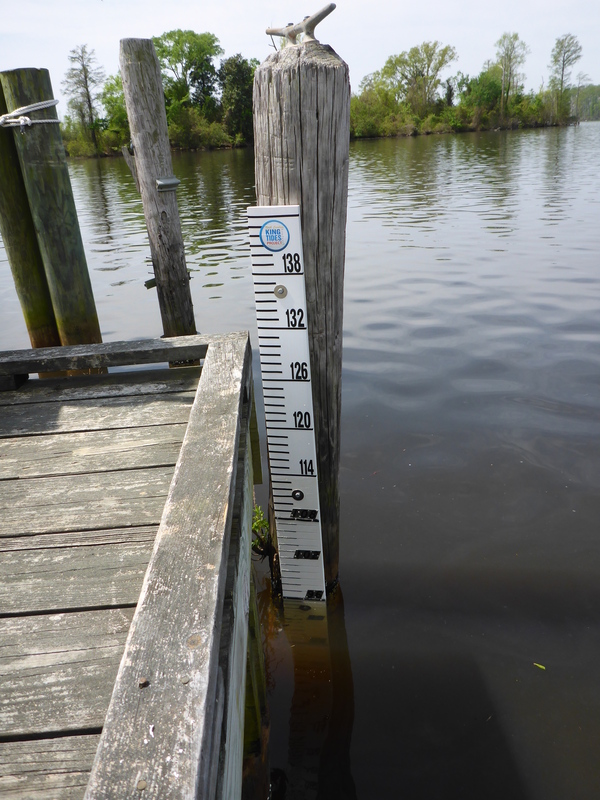 We are looking for citizen scientists to help monitor water levels all across the NC coast! With funding from North Carolina Sea Grant and Carolinas Integrated Sciences and Assessments, the NCKT Project will expand to include water-level monitoring, conducted by trained citizen scientists using gauging stations. 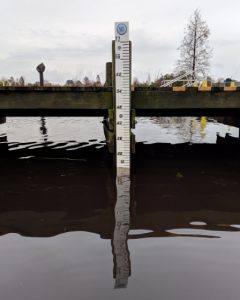 The NCKT Team is collaborating with coastal members of the North Carolina Association of Floodplain Managers who will provide guidance on where records of water levels are most needed. 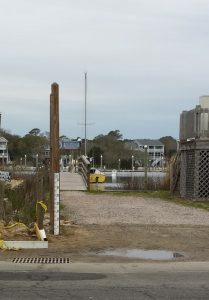 A UNC-Chapel Hill Institute of Marine Sciences team will furnish and install water-level monitoring materials, provide training and continued support for participants, and serve as a conduit facilitating information exchange between citizen scientists, coastal zone managers, and researchers. 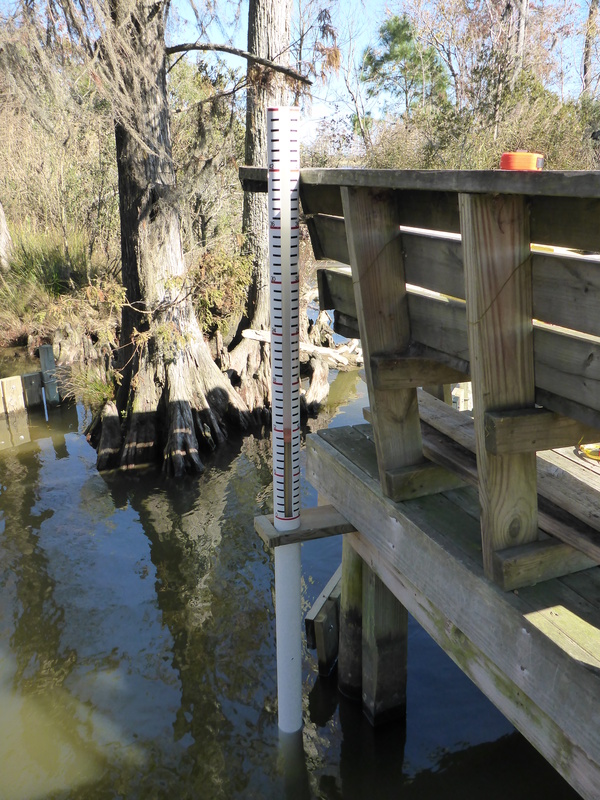 Citizen scientists can easily submit their measurements using the What’s your water level? App Water Level Reporter webpage as shown on the right. 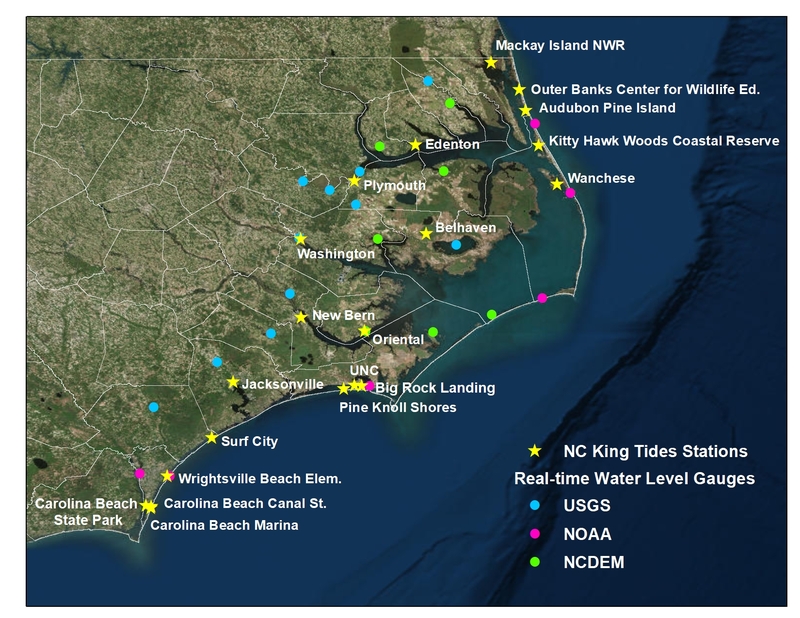 Currently, the National Oceanic and Atmospheric Administration (NOAA) has six water level stations and the NC Emergency Management (NCEM) has six additional stations along the North Carolina coast. 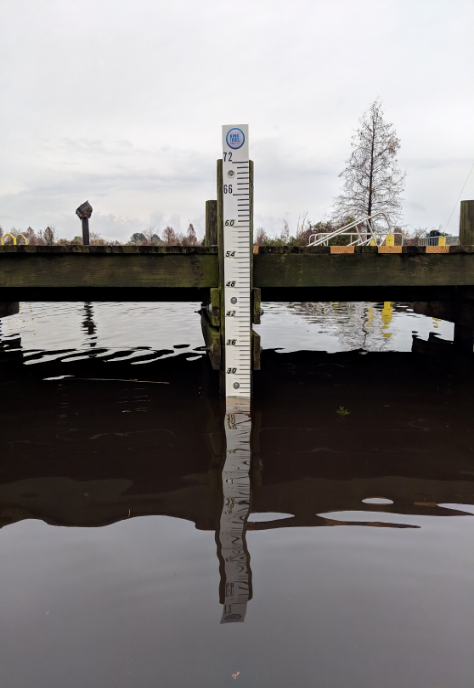 As high water-level events become increasingly common and coastal areas experience more frequent nuisance flooding, there is a growing need for more spatially explicit water-level data throughout our estuaries. 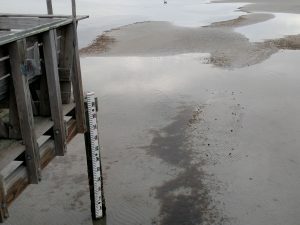 In North Carolina, the intermingling of natural forces including astronomical tides and wind can lead to very high or very low water levels and can make predicting water levels a difficult task, especially on a local scale. 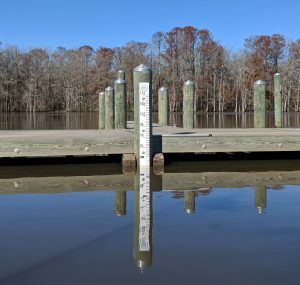 The water-level data contributed by this project are both spatially and temporally specific, collectively facilitating the opportunity for analysis and synthesis and a more holistic understanding of water-level patterns throughout coastal North Carolina. 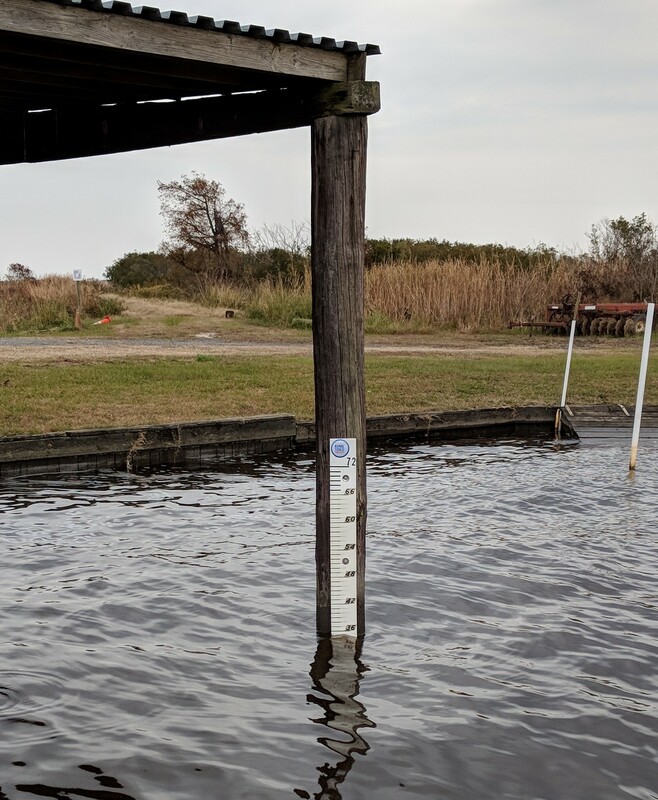 By monitoring and reporting water levels, citizen scientists make important contributions to the communities in which they live, providing information essential for the proactive planning and policy decisions made by local officials and coastal zone managers. Such measures are needed for building coastal resilience to protect coastal property, habitats, and the ecosystem services each provides. This effort is set to begin fall of 2017. 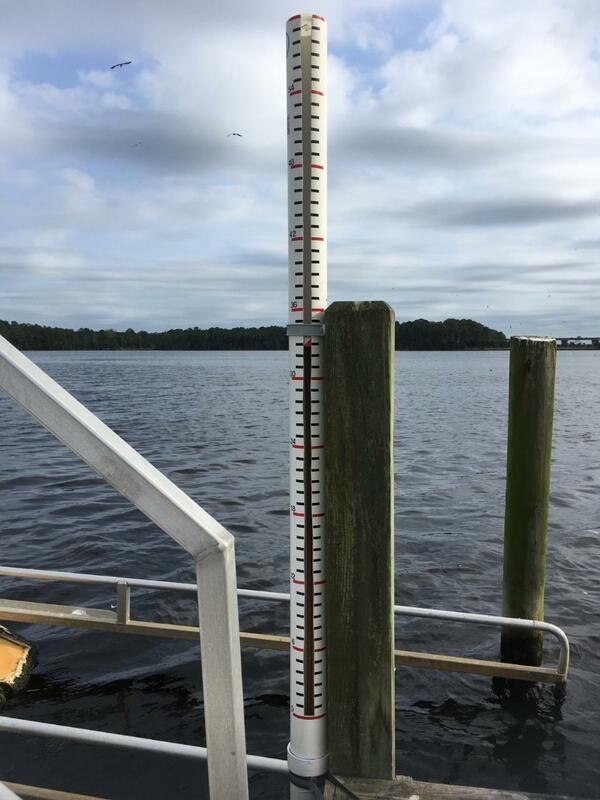 Our goal is to have at least one water level station in each of the 20 NC coastal counties protected by the NC Coastal Area Management Act: Beaufort, Bertie, Brunswick, Camden, Carteret, Chowan, Craven, Currituck, Dare, Gates, Hertford, Hyde, New Hanover, Onslow, Pamlico, Pasquotank, Pender, Perquimans, Tyrell and Washington Counties. 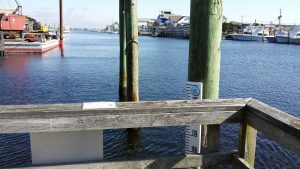 Who better to collect data than the citizens who live in our coastal counties and have an intimate understanding about what drives local water levels? Participants in this project should readily have access to estuarine waters (rivers, sounds, bays, canals, etc.) and need to be able to collect a minimum of one reading from their water-level station each week. 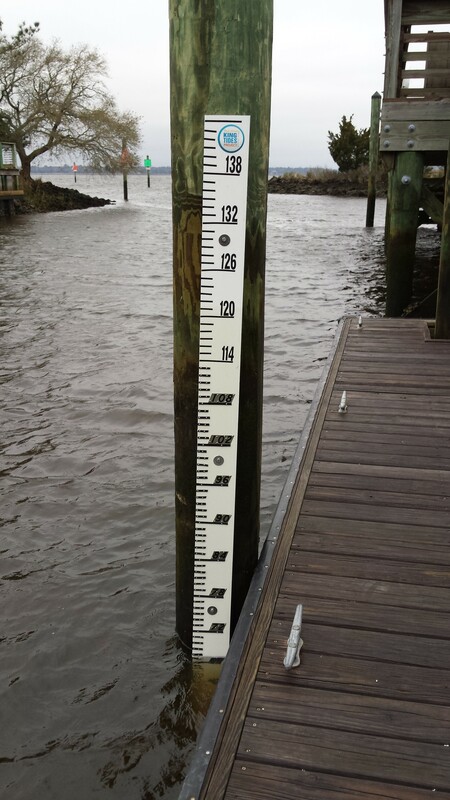 Water level gauges must be affixed to a vertically stable structure such as a dock, piling, or bulkhead that captures the full tidal range. We welcome participation from private citizens or from community groups including homeowner associations, residential developments, environmental groups, schools/universities, etc. 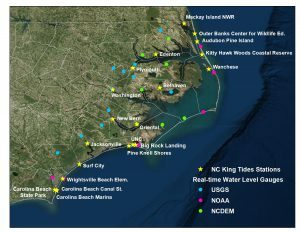 If you would like to get involved, want more information or have any questions, please email North Carolina King Tides at nckingtides@gmail.com. 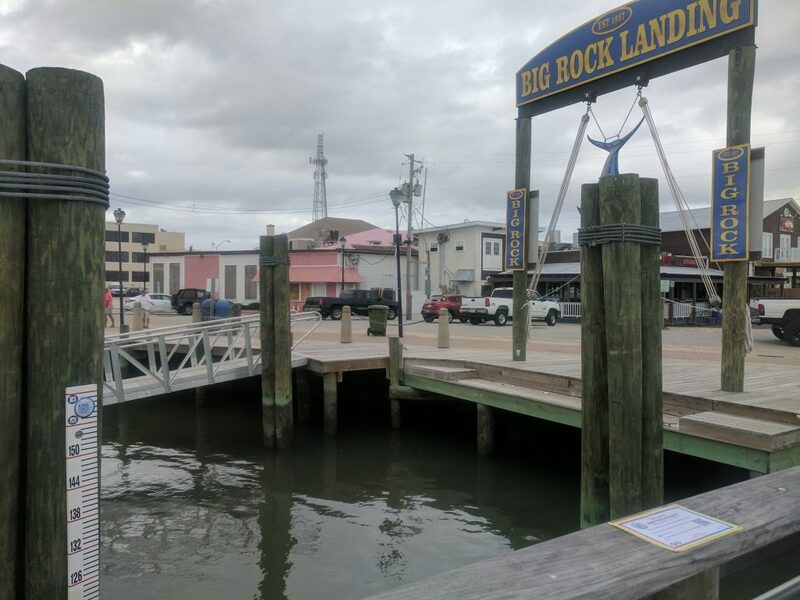 The benchmark staff at Big Rock Landing in Morehead City, NC during low tide (left) and high tide (right). When visiting these stations, take photos of the staff and the surrounding area. 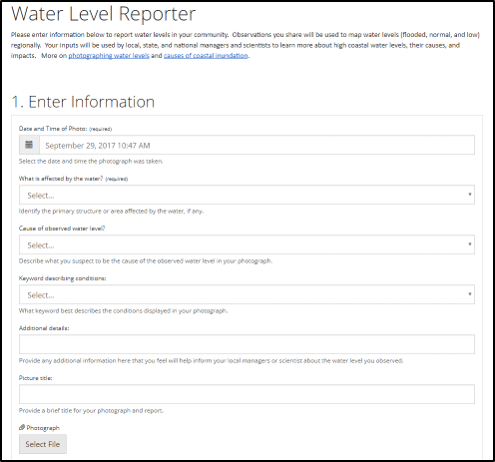 Then submit a water level report and photos on the Water Level Reporter GeoForm. This staff measures the depth of the water relative to the bottom in inches. NAVD88 is at 13.52 inches. 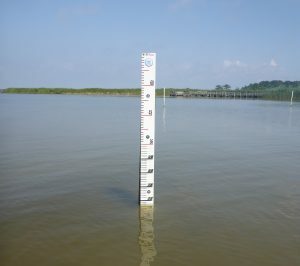 This staff measures the depth of the water relative to the bottom in inches. NAVD88 is at 49.50 inches. 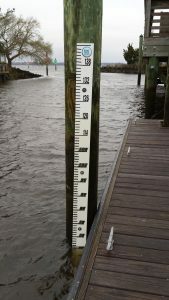 This staff measures the depth of the water relative to the bottom in inches. 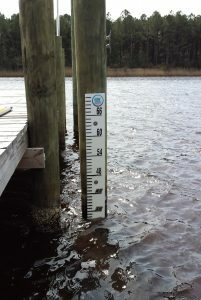 This staff measures the depth of the water relative to the bottom in inches. NAVD88 is at 59.78 inches. 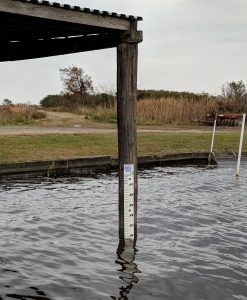 This staff measures the depth of the water relative to the bottom in inches. NAVD88 is at 7.44 inches. 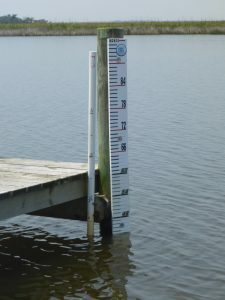 This staff measures the depth of the water relative to the bottom in inches. NAVD88 is at 31.84 inches. 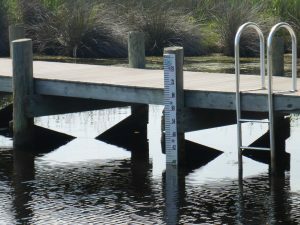 This staff measures the depth of the water relative to the bottom in inches. NAVD88 is at 35.06 inches. 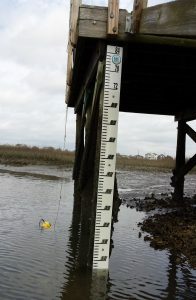 This staff measures the depth of the water relative to the bottom in inches. NAVD88 is at 11.95 inches. 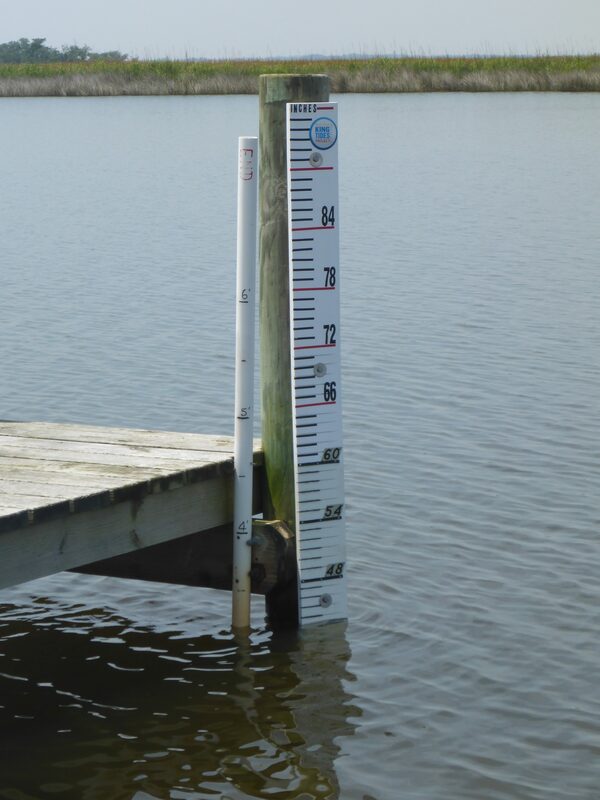 This staff measures the depth of the water relative to the bottom in inches. NAVD88 is at 89.88 inches. This staff measures the depth of the water relative to the bottom in inches. 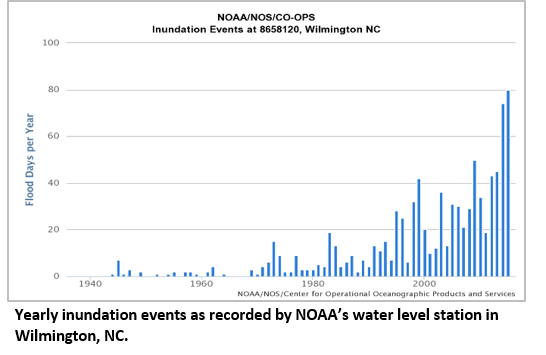 NAVD88 is at 82.68 inches. This staff measures street flooding at the intersection of Canal Drive and Sandpiper Lane. When high water-level events occur, water from the canal tends to come up through the storm drain, causing nuisance flooding in the road. NAVD88 is at -34.88 inches. 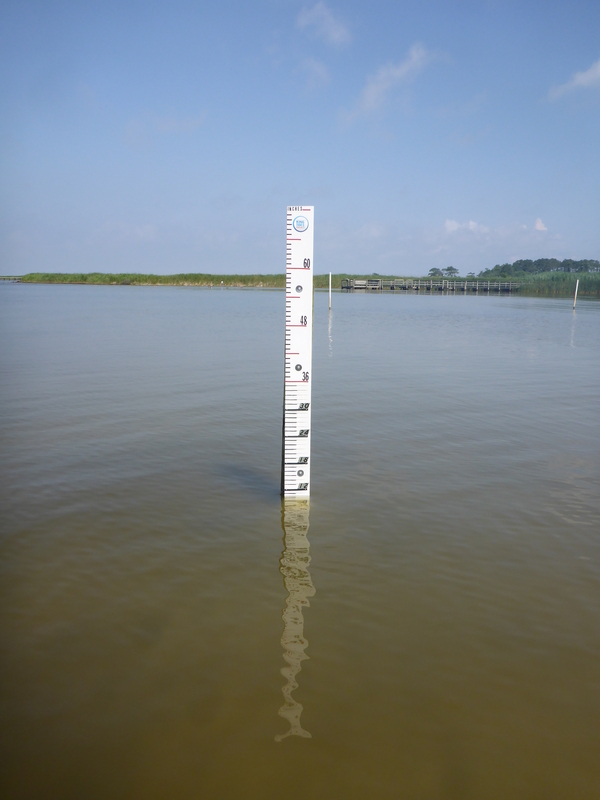 This staff measures the depth of the water relative to the bottom in inches. NAVD88 is at -34.88 inches. 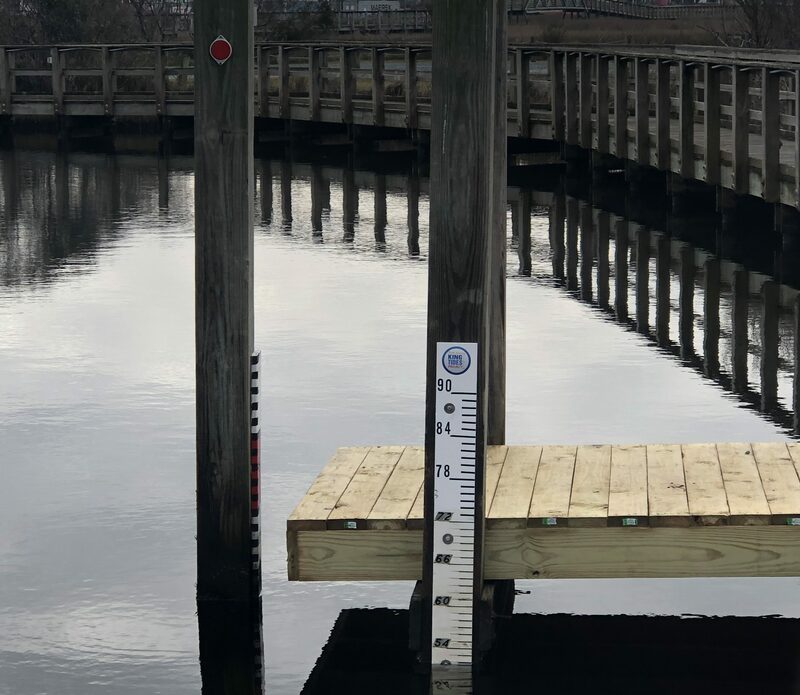 Staff measurements show depth of water relative to the bottom in inches. “NAVD” marks 0 relative to NAVD88 according to NGS survey benchmark DJ9298. This staff measures the depth of the water relative to the bottom in inches. NAVD88 is at 15.33 inches. 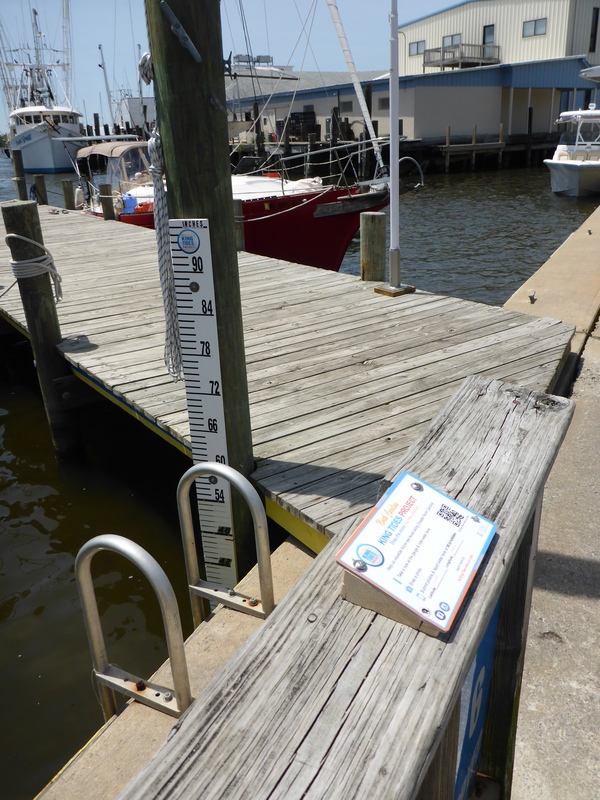 This floating dowel gauge measures the depth of the water relative to NAVD88. NAVD88 is at 16.39 inches. This floating dowel gauge measures the depth of the water relative to NAVD88. NAVD88 is at 4.41 inches. 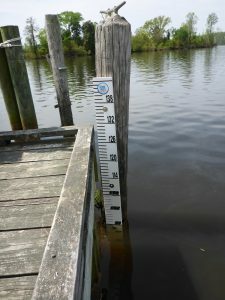 This staff measures the depth of the water relative to the bottom in inches. NAVD88 is at -0.82 inches.